August 27, 2012 By arzea 12 Comments This post may contain affiliate links. Read my disclosure policy. Last week I was browsing at the grocery store when I noticed a big container of Spicy Wasabi Arugula on sale. Regularly $6, I snatched it up for just under $2 and didn’t look back. But Wasabi Arugula….what could I use this for? I recalled the spinach pesto I made for grilled cheeses not too long ago, and thought I could probably use this arugula and do a pesto with it…..pesto doesn’t always have to be made with basil, right? 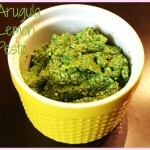 So I figure this pesto can be made with any type of arugula, or green leafy veggie. I also wanted to cut down on the oil a little bit, so I decided to add some lemon juice to help with the blending process. 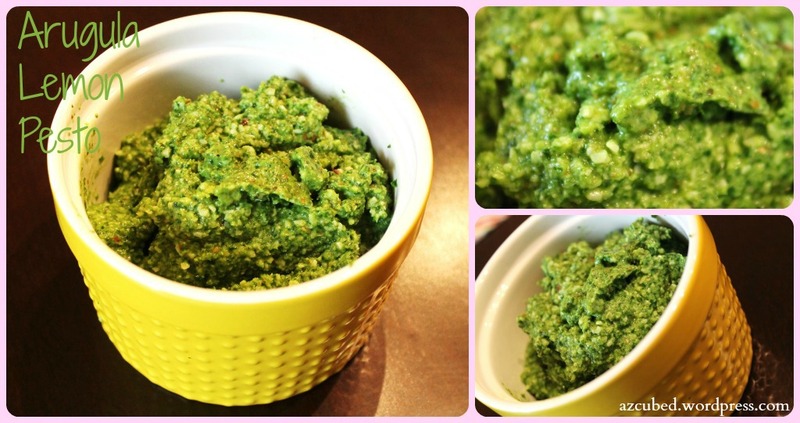 I might try kale pesto next….sounds good, right? Use this for a pasta, chicken, fish, veggies, roasted potatoes, or pizza….the options are endless! Put it on a grilled cheese like I did with my spinach pesto, drool! 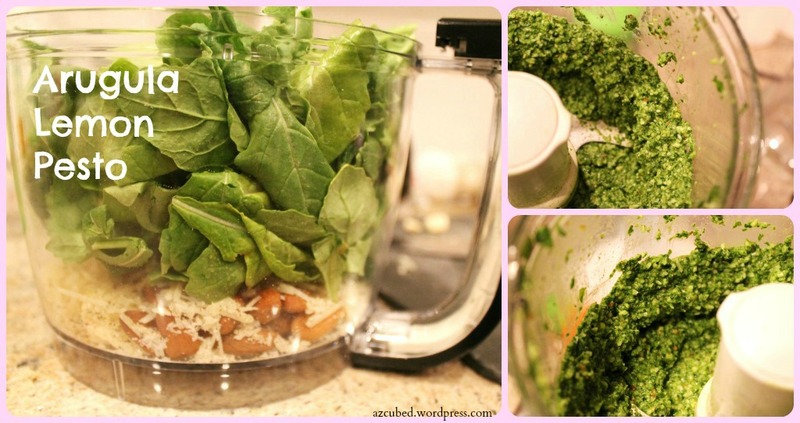 Combine the arugula, salt, nuts, garlic into a food processor. Pulse mixture. Add parmesan cheese and pulse mixture. Continue to pulse while drizzling the olive oil into the processor. Add lemon juice last and pulse until combined. Remove the mixture from the processor and put it into a bowl. Use for whatever you want! Sometimes it’s good to make extra pesto and save some for later use. I love putting a some into freezer trays, freezing, then popping out into a zip lock bag. Presto! Pesto whenever you need it! thanks! it is super yummy! Great idea with the lemon juice, I totally have to try this next time! And Pesto is the best, it can be used in so many dishes! I know! It really cuts down on the calories with what you save on the extra oil! I loooove pesto! Wow what a great idea. I’m definately going to use this one on my pasta with veggies dish. Looks amazing! We have our Pesto cooking class tomorrow, so I’ll give them a “shout out” to your blog for this recipe and the ideas for using pesto. Thanks!! Hope your week is going well. Thank you!! It was really good! I love experimenting with different things for pesto. Things over here are really good, especially since I finally finished my massive hutch re-do…check out my latest post! !